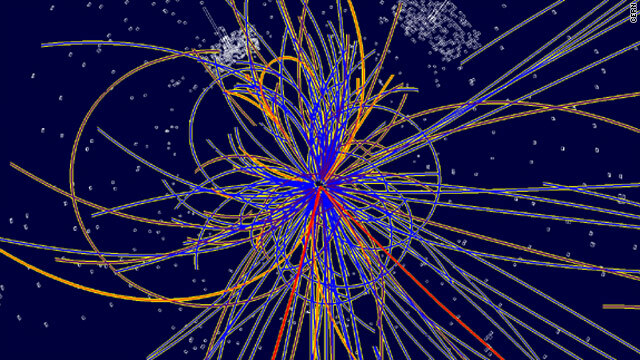 The Higgs boson (the particle that gives all matter its mass) — sometimes referred to as the “God particle” has recently made news. This particle was found by smashing protons together at high energy in the $10 billion Large Hadron Collider (LHC) at CERN in Geneva, Switzerland. “…This unimaginably small particle has never been detected, but would explain several unsolved mysteries about the universe – for instance, why building blocks of our world have mass.”Elizabeth Landau, CNN. “The Higgs boson is the last missing piece of our current understanding of the most fundamental nature of the universe,” Martin Archer, a physicist at Imperial College in London. This entry was posted in Biology, Chemistry, Computer Science, For Faculty, For Graduate Students, For Students, General News, Mathematics & Statistics, Physics & Astronomy, Uncategorized and tagged Astronomy, boson, higgs, matter, nuclear, particle, physics. Bookmark the permalink.